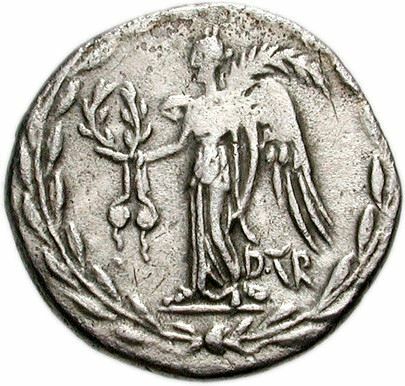 Decimus Turullius was one of the moneyers for the year 31 BC, where he struck coins jointly with Marcus Antonius. He also served as Quaestor in 44 BC. He is mentioned as one of the murderers of Caesar, and afterwards he and Tillius Cimber went to Bithynia , and took command of a fleet there. After the battle of Philippi in 42 BC, he fled to Sicily with his fleet and a large sum of money he had extorted in Rhodos. After the battle of Naulochus in 36 BC, he entered the service of Marcus Antonius with whom he was on good terms. Nevertheless, Antonius handed him over to Octavian following the battle of Actium, and he was executed on the island of Kos.